I just wanted to say “THANKS” to the scores of folks who have already bought the book and if you would like it autographed please bring it along when you come to visit us at Lake Chapala and I’ll be happy to do so..
As I pen this we’ve received 28 Reviews on Amazon .com. The vast majority (25) rated it as 5 STARS ***** and the other 3 rated it as 4 STARS ****. I deeply appreciate each and every rating. So for those that took the time to give a review, “THANK YOU, THANK YOU, THANK YOU!” And, of course a BIG THANKS as well to those who bought the book, but did not post a review. “We’re preparing our retirement move to Chapala and hope to be on our way in a couple weeks. We were given the grand tour by Sid a couple of years ago and took notes! This gentleman is a fountain of information. My husband commented that” his new book is just as if we were driving around with him again”. Yes, I agree, he’s so very personable and that’s evident even in print. 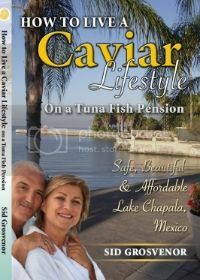 We think he’s an Ambassador to Mexico for expat retirees and his book is terrific.OU”. Thanks Ingrid, you made my day! By early next year I hope to have book copies for sale at various vendors in the Lake Chapala area or of course directly from me. P.S, If you’ve not seen the promo video for the book here’s the one from the QR (Quick Response) code on the book jacket back inside flap.